Great shot Tink! Great perspective! Great shot with the rearview mirror, too!! Such an interesting shot, both in the forward view and the mirrored view. 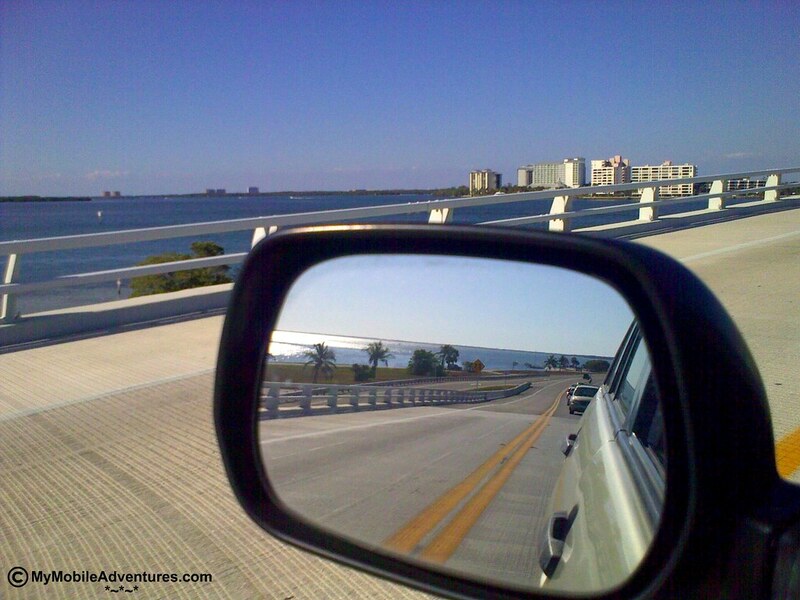 I like taking pictures of the side mirror where there are great views behind! Happy MM! Remarkable creativity in your photo … and it looks like a beautiful day in the city! I invite your blog readers to shine the light on Caribbean American HIV/AIDS awareness day! I love it! Thanks for sharing. Happy Blue Monday! Love how you took this photo. Creative! WOW…I love it!! Great photo. What a unique shot.. the water in the picture ahead and the reflection behind. Just lovely! Fun photo, and on a perfect day. Life is good. That is a beautiful photo. Have a wonderful day. Forward and backward looking at the same time. Check. Very cool photo, Tink! Happy Blue Monday! Have a great week. What a fantastic shot, Tink~. Your the best!